It’s hard to start from scratch 20 years after your debut album, but that is essentially what Skye Edwards and Ross Godfrey of UK Trip-Hop/R&B legends Morcheeba have done this year. As previously discussed on this website, Skye and Ross decided to strike out on their own following the departure of third Morcheeba member (and Ross’ brother), Paul Godfrey. Considering the duo’s past work together, it comes as little surprise that their brand-new eponymous album is everything you could want and more. However, the album had yet to be released when they hit the road in the US without the benefit of the Morcheeba name on the marquee. While the current tour unquestionably marked the start of an odd chapter in the careers of two musicians who’ve already sold millions, their August 27 show at the Paradise Rock Club in Boston proved that huge changes to both brand and personnel couldn’t diminish the magic that these people create when they hit the stage. Opening with a brilliant rendition of Morcheeba’s ’96 classic, “Trigger Hippy,” Skye and Ross made it clear that they intended to celebrate their past while guiding the audience into the future. Interestingly, one of the evening’s brightest moments came when the crowd joined Edwards in singing a new song, “Light of Gold.” Whether they were performing a recent creation or a Morcheeba mainstay, Skye and Ross kept the crowd enthralled. Skye’s voice was as flawless as ever, while Ross remains the Jimi Hendrix of the Trip-Hop world. 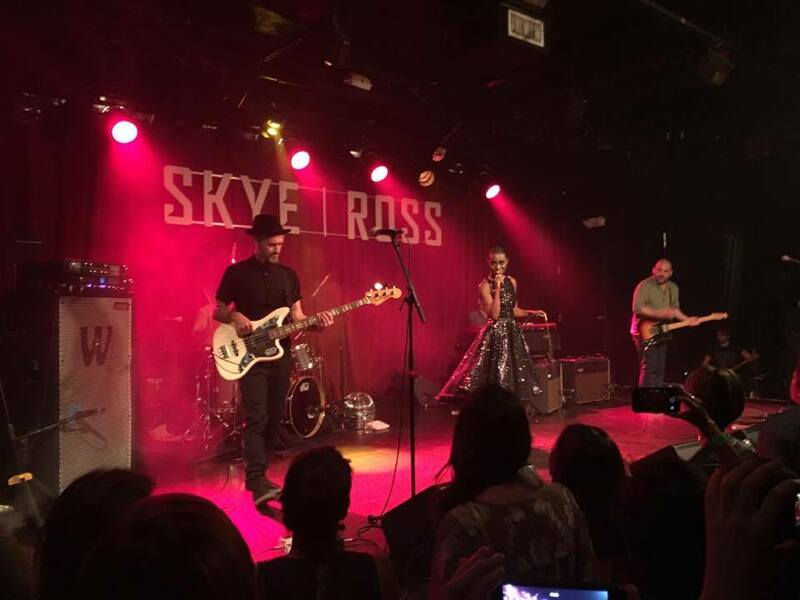 Like their new album, Skye and Ross’ show at the Paradise show was a family affair. Skye’s son Jeaga was on drums, while her husband, Steve Gordon, played bass. (Keyboardist Ben Cowen rounded out the team.) Skye and Steve’s little girl, born last year, was also along for the ride – but of course with ear plugs in and safely away from the stage during the gig. Although the music was certainly enough to keep concertgoers entertained, the warm and welcoming vibe of the people on stage only added to the enjoyment. Skye conversed with the crowd between numbers, chatting about everything from her very nice – but undoubtably uncomfortable – heels to the follies of youth. (“Remember when we used to get stoned to Morcheeba?” she asked with a laugh that was echoed by many in the audience.) When not singing and joking, she was filming and photographing the crowd for posterity – and even took a few selfies with audience members who joined her on stage to dance. The party continued after the show, with Ross giving out shots of vodka and tequila (and big hugs) at the merch table. Skye and Ross may have brought mellow tunes to the Paradise, but the two were Punk Rock in spirit. Yes, Skye and Ross arrived in Boston without the drawing power of their previous moniker. Yes, most in the crowd were totally unfamiliar with tunes from an album that was still a week away from stateside release. Yes, this was far from an ideal scenario for any touring band, let alone one that traveled from overseas with a toddler in tow. But what this very special combination of people was able to produce at the Paradise transcended all of these obstacles. The players may not have been able to see them through the stage lights, but the looks of sheer joy from the audience told the tale. This is glorious music delivered by inspiring people – no matter what name they use. Skye and Ross’ self-titled album is out today on Fly Agaric/Cooking Vinyl.